Editor’s note: This piece was originally posted on Hockey in Society on October 14, 2013. It was also published by Left Hook Journal on October 20, 2013. With the 2014 International Ice Hockey Federation’s Men’s World Hockey Championships kicking off today in Belarus, we are reposting this article as it is still a highly relevant reminder of the political controversies and power struggles going on behind the scenes of this hockey tournament. The 2014 Winter Olympics in Sochi, Russia have become a flashpoint for protest due to the country’s draconian anti-gay laws and the Russian state’s laissez-faire attitude toward documented violence directed toward gay individuals. This has sparked calls for a boycott of the Games and, given the significance of hockey in Russia and the Winter Olympic program, has led many hockey bloggers, media, and personalities (Brian Burke, Victor Hedman, Henrik Zetterberg, and more) to speak out against the laws. Meanwhile, hundreds of thousands of Brazilians took to the streets to protest the government’s high spending on the 2014 FIFA World Cup and the 2016 Summer Olympics, whose economic impact is to the benefit of Brazilian elites at the same time as ordinary citizens face cuts to social services such as health and education. The 2022 World Cup, to be held in Qatar, has been thrown into controversy after an investigation by The Guardian revealed widespread labour exploitation and abuse of immigrant workers, largely from Nepal. Each of these examples highlights some of the ways that sport is enmeshed in, and can contribute to, unequal power relations between individuals and groups in various societies around the world. Thankfully, sport mega-events are increasingly coming under public scrutiny and are having their politics examined in the press. However, there are many other examples of sport contributing to social injustice that are happening on a smaller scale. One such event, which has gained relatively little media attention (especially in North America), is the upcoming 2014 Men’s World Hockey Championships in Belarus. The 2014 International Ice Hockey Federation (IIHF) Men’s World Ice Hockey Championships (commonly known as the World Hockey Championships) was awarded to Belarus in 2009. In many ways, the choice makes a great deal of sense: Belarus, a former republic of the Soviet Union, has never hosted a major international hockey tournament since gaining its independence in 1991; the country has enjoyed modest success in international men’s hockey and the sport enjoys a passionate following amongst Belarusians; and the country’s President, Alexander Lukashenko, is a massive hockey fan who has spearheaded arena construction across the country. However, there is a dark side to Belarus’ hosting of the World Championships – and, quietly, talk of moving the tournament to another country. The Belarusian government continues to severely curtail freedoms of association, assembly, and expression, and the right to fair trial. September 2012 parliamentary elections preserved the status quo, with a victory for parties allied with President Lukashenko. The opposition won no seats. New restrictive legislative amendments have paved the way for even more intense government scrutiny of civil society organizations and activists. Government harassment of human rights defenders, independent media, and defense lawyers continues, including through arbitrary bans on foreign travel. Belarus detains a number of political prisoners. Allegations of torture and mistreatment in custody persist. When the plane touched down at the Minsk Airport, a throng of better than fifty media members awaited the Stanley Cup’s first ever moments in Belarus. . . . Khabibulin held a press conference at the airport, welcoming the Stanley Cup, then took the trophy to Junost, an arena in Minsk. Belarus President Alexander Lukashenko donned hockey equipment and took to the ice along with members of the national team abetted by Nikolai Khabibulin in goal to face off against Junost Minsk. Teammates continually fed the president passes on the tape of his stick until at long last, he beat the netminder for Junost Minsk. Last year [Lukashenko] dismissed the threat of a Western boycott as “pure politicking”. 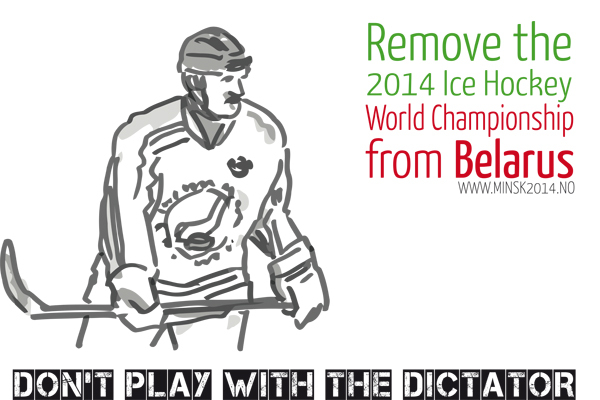 Ice hockey is highly political in Belarus. 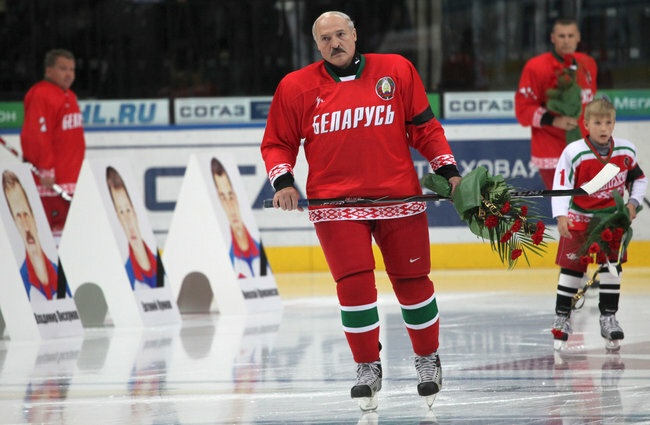 Its president, a renowned hockey player and self-confessed dictator, Alexander Lukashenko, is using hockey to play for legitimacy. . . .
For a country popularly known as home to “the last dictator of Europe,” there was surprisingly little outrage in 2009 when Belarus was awarded the right to organize the championship. Some saw it as a chance to open up Belarus and its economy. René Fasel, the President of the International Ice Hockey Federation (IIHF), was determined to focus on sport. He praised Belarus as a “hockey nation” and said he is always happy to go to Minsk. . . . Despite [efforts to move the tournament], Fasel confirmed the decision to hold the games in Minsk. He fell back on the dogma that “sport cannot and should not be a political tool”, ignoring the reality that his sport is already highly politicised, and a tool for one of the most infamous regimes in Europe. Ice hockey championships is like the Olympics, it’s a matter of prestige and I don’t personally want ice hockey to be associated with the dictator in Belarus. To hold the 2014 IIHF World Championship in Belarus would support and legitimatise a regime which violates the human rights of the people of Belarus in an alarming way. We urge the IIHF and the representatives of the national IIHF member organisations to support the victims of human rights violations by removing the 2014 IIHF World Championship from Belarus. It is encouraging to see a movement emerge to contest the Lukashenko regime and its attempts to bolster its legitimacy through hosting the World Hockey Championships. However, it remains to be seen whether the campaign will have any success – certainly, a relocation of a tournament scheduled to take place in six months seems unlikely, and a boycott by any participating countries even more remote. That being said, last month Lukashenko himself admitted the possibility of a boycott or relocation. Even if it is unsuccessful in moving the World Championships, the campaign still has an opportunity to raise awareness of Belarus’ human rights abuses and leverage the tournament to pressure politicians into pushing for the Lukashenko regime to reform its practices. Raising widespread public consciousness of Belarus’ human rights record, while certainly not enough to change it, is certainly an important step in pushing for change. That being said, when the cameras roll, the crowd cheers, the national anthems play, and the puck drops to open the tournament, will the lives of Belarusian citizens and activists be improved or look more hopeful? That question will be central to determining whether or not the campaign against the Lukashenko government and its hosting of the World Championships has been able to make a difference.